Discussion in 'Repros' started by ButteMT61, May 21, 2014. I think this is awesome, and it sorta addresses something I brought up years ago about the utter perfection of the top maker's jackets. I noticed it has the "Acme" tags...wonder if they will get the new approved "Aero" labels? John is wearing it in these pics from my Facebook feed- looks even better in person. Cool pics! Yeah, look pretty legit. And it's nice to have something that you don't worry about getting scraped, dirty, wet, etc. Thanks for posting those up - great stuff! this is it -100% what he should be adding to his offerings!!! Not sure to be honest, so basically it is ' time worn' and if not done correctly I would think it would make the jacket look naff also from the photos, this jacket could quite easily be confused with ELC's .50Cal A2.....I'm on the fence with this one I'm afraid. This is an accurate copy of an original Aero, whereas ELC's .50 Cal is not. I think it looks tremendous, just like a worn 1942 A2. Inaccuracies in the stitching were a feature of many original jackets. Pretty cool. I'd wear one in a moment. It looks a little scruffy, like me. It looks great, but it's all theoretical until there is some idea of the price differentiation quoted. It's a factor that will have strong influence on the product and its marketability. The more imperfect stitching should cut down on production time, but time saved there is more than lost on the aging treatment. I've done aging treatment on garments and other items, it takes a lot of time. Much more would be invested in weathering, than the time saved on stitching, is my estimation. I own an Eastman .50 Cal A2 and although it looks good, there are aspects of the weathering treatment which look a bit off. Let's not forget that the Eastman "Time Worn" treatment makes a garment non-returnable. That factor has made me less inclined to have the treatment done (not that I am likely to have it done anyway, since I could accomplish the same results to my liking on my own with a few hours time). Within the A2 jacket wearing community, there are some who have high expectations on fit, etc, and quite a few jackets end up being sent back to the maker for exchange or re-make. I wonder what the implications would be with weathered treatment added to the mix. But then again, I would rather break a jacket in myself anyway, so my comments may be somewhat irrelevant. That being said, I would be interested in a 'Combat Clone' A2 (ideally at a lower price), but not in one with the weathering treatment. I fit that as well. Of course price is a big factor - if it's $1200 as opposed to $1500+ for a "normal" GW, then no. But if it comes in at $600-700, I think it's a solid winner. I'd love to see it even less, but I have no idea on what a jacket like that costs to make. Lower is better, but not if it means it's not up to JC's standards. 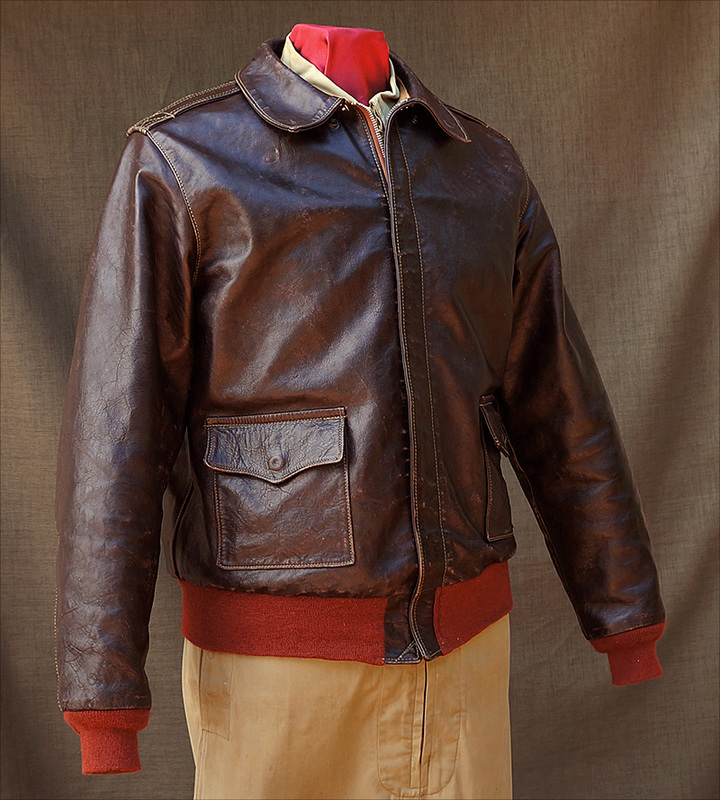 This jacket is one of the most appealing I've seen offered up - even though it's not yet for sale. I agree Scott. Price will be very important. I wonder how the price of these jackets will compare with the GW off the rack range? Personally, I don't see how something that takes time, skill, and effort to do will cost less. Andrew, I'm thinking - I know, dangerous - maybe these would be in the OTR lineup? It would make perfect sense as the WWII chaps never got a choice on arm length, hides, etc. It would be, IMHO, the ultimate WWII-era A-2. Of course other's criteria vary greatly as was stated above, but I've always clamored for this jacket right here. And given the economics of my personal life, it fits much better into my budget for such things. Simple - it's not being made by JC. Just like I get like 4x more money to do what I do, even though some of the other guys on the team do "similar" things. That's why owning your own biz is better than being me in the corporate world - they will dump me for the cheap kids if they can do a half-decent job at what I do. JC's discription of the "Clone" says the treatment can be applied to any contract Goodwear makes. Maybe you know something I don't, but this appears to me to be an add on to either the newly introduced, lower priced, "off the rack" GWs not sewn by him, and the masterpieces that are. Sorry, but no way would I pay for a 'New' beat up jacket. Be it a ELC 50 cal or a GW jacket. Looks pretty good to me. As with anything JC does I'm sure he's thoroughly thought this out and would do a pretty good job of not over doing the 'aging' process. That said, I don't get why many people are so afraid to actually wear their Good Wear's? I know they are expensive and take awhile to get but they aren't 'dress jackets' and are pretty damn tough pieces of kit. Hey, the nice thing is if he pursues this line, you don't have to buy it! You can still wait and pay the price for a JC work of art. I think it's smart to branch out. Some will like these, some won't. A smart seller sees holes in the market and fills 'em. I think he qualifies.